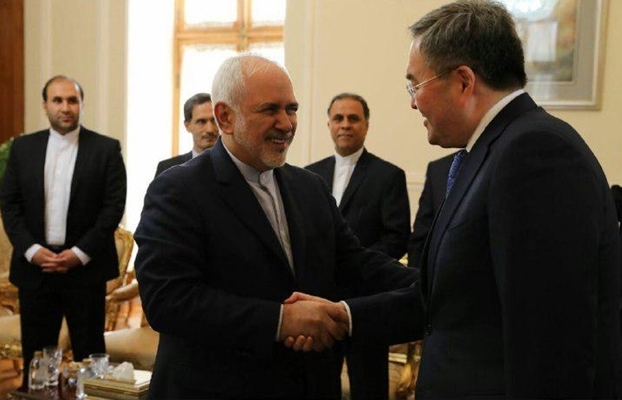 Iranian Foreign Minister Mohammad Javad Zarif and Kazakh Deputy Foreign Minister Mukhtar Tileuberdi sat for talks on Wednesday on mutual and regional issues. “In Kazakhstan’s multilateral politics, Iran has always been deemed as an important country and we are after expansion of our ties with the country,” he said. During the meeting, the two sides also discussed mutual, regional, international issues, the legal regime of the Caspian Sea, creation of a joint economic and transit commission and expansion of consular cooperation. They also exchanged views on the US’ illegal sanctions on Iran, dangerous aspects of the US’ recent move to designate Iran’s Islamic Revolution Guards Corps (IRGC) as a terrorist organization, building joint transportation corridors, the upcoming Conference on Interaction and Confidence-Building Measures in Asia (CICA) in Tajikistan, and Kazakhstan’s support for the Iran nuclear deal. Tileuberdi is on an official visit to Iran to take part in the 16th round of political consolation between Iran and Kazakhstan.